Natalie Whipple is an author that I would definitely read again. 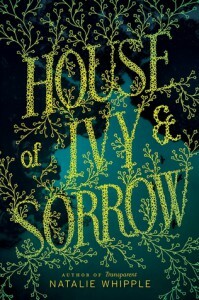 House of Ivy and Sorrow's characters are well developed, even the minor characters. I was in a slump when I starting reading this YA novel; but once I sat down with the book, I couldn't put it down. Friendship and family are integral to the plot; coming of age, trusting, which friends are more like family, and family secrets keep the plotline moving at a good pace.